This past week I have become one of those cliche pregnant ladies in major nesting mode. I just want to organize all the things. So now, logically, I am organizing my thoughts about running while pregnant. I have a race coming up this weekend, the Cherry Blossom Ten Miler in Washington, D.C. I had a moment this Saturday when I thought to myself, I don’t think this race is a good idea anymore. I was at home in New York for Easter, and I had forgotten how much harder it was to run up hills versus the coastal plain where I currently live in Virginia. I had to stop twice because I felt like my heart was beating out of my chest. I’m still doing the race, I just know it’s going to be tough carrying around the 13 extra pounds I’ve gained so far. 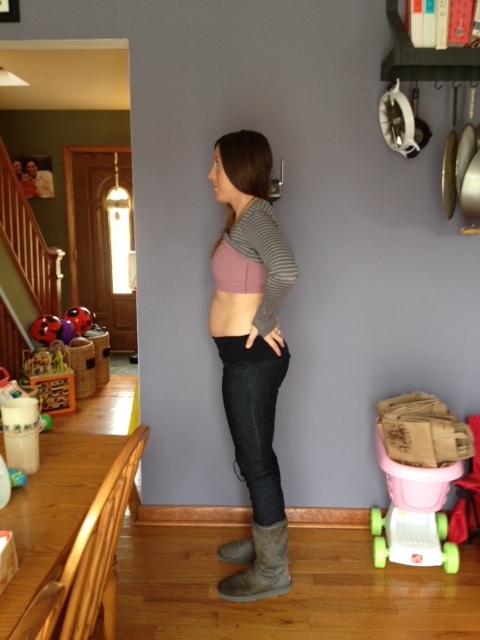 12 weeks (130 lbs according to doctor’s scale) and I thought I looked pretty large then, ha! 18 weeks (139 lbs according to doctor’s scale) Booty and bump are blossoming. I had a dream over the weekend that I stepped on the scale and it said 140 lbs. The scary part is that the next time I go to the doctor, I know it will say at least 140 lbs and I am going to have to not freak out about it. I have been able to run more this week since I’m on spring break, so I hope that this will get me back on track to run more than just on the weekends. During the first trimester, all I wanted was burritos and guacamole, and then I started craving Greek salads. I was nauseous and really tired all the time. Running suffered, because instead of making me feel better it made me feel worse. I never actually threw up, but I had some moments of moaning in agony because I felt so sick. For the month of January I ran 72 total miles and my longest run was 9 miles. Most of my runs were between 6 and 9 miles. In February I ran 60 total miles, with my longest run at 12 miles and shortest at 6. I felt pretty crappy in February. In March I started to get some energy back. I ran my first race, the Shamrock 8k on March 16th. My total mileage for March was 57 miles with my longest run at 12 miles. Most of my runs were at least 6 miles, but I did a 3 miler once because that’s all I had time for. I’m very fortunate to have a doctor who also runs and races triathlons. She is very supportive of my running as long as I don’t overdo it. I asked her for advice on the Boston Marathon, because I was considering running at least half of it, but we decided together that it wasn’t a good idea. Boston will have to wait until 2014. I had a thought today during my 6 mile run that turned into a 3 mile run, 3 mile walk… I should really stop being so hard on myself. Part of me feels good for even being able to run at all, and part of me feels so lame for my slow pace. It’s a tough adjustment. I thought I would embrace the forced rest, but I realized that I never really run slow. I thrive off of a fast pace. I don’t like that my husband can run faster than me now (but I’m sure he enjoys it). I keep daydreaming about running a marathon after the baby is born, and about spring track season. I’ve been keeping a journal to write down my goals. But I need to be satisfied with my efforts and remember that a few decades ago women were discouraged from exercising at all during pregnancy, so I really am lucky to have running as an outlet (even if it’s slow running). I should also mention that I’ve been supplementing my running with prenatal yoga and a few workout DVD’s I purchased from Amazon. My favorite one is the Summer Sanders Prenatal Workout. It doesn’t seem that difficult compared to running, but damn does it make me sore the next day! Any mamas out there have advice for pregnant runners? Did you supplement your running with any other workouts? Anyone else afraid of hitting an all-time high on the scale like me? oh jeez. your 12 week weight is like my baseline! oh well! 😉 looking good, mama-to-be! Ha, well thanks Meggie! I have a feeling it will be awhile before I see 130 again. Aww, you are so cute and tiny! I know you feel huge, I remember that feeling, but you look GREAT! It’s wonderful that you have a doc who knows about athletes. That is very rare and lucky to find in a doctor! 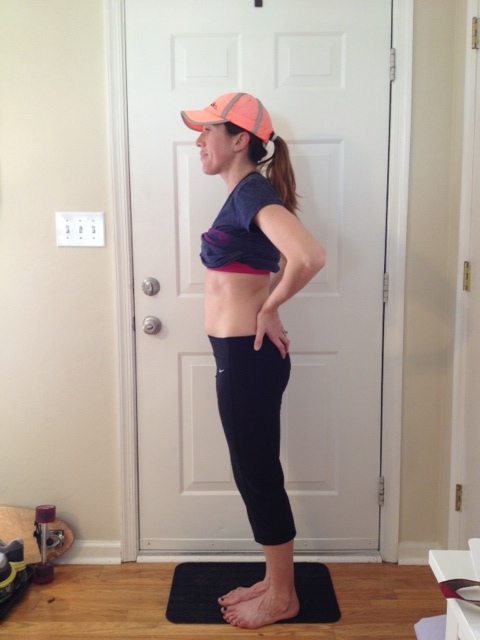 I ran every day when pregnant, but it was very slow and not too far. I ran 30 minutes a day, and didn’t run with GPS at the time so while I called it 4 miles, I know it was MUCH less! 🙂 As I got into the last 4 weeks, I probably did more like 2-3 miles a day and there were definitely walking portions in there. Throughout the pregnancy, I also did a lot of walking in addition to the running since we were living in Boston, I had just stopped working, and we didn’t have a car. I think now is a perfect time to plan for running in the future (post baby) and enjoy the easy runs. It’s hard because I had some of my most inspiring days while pregnant (thinking about the future) but my body obviously had a more important job to do than run fast. All the slow, heavy feeling runs while pregnant made running that much more refreshing after I gave birth. I’m SO thankful I didn’t try to push it with running when pregnant and just enjoyed it. I always tell runner mommas that’s my best advice. Just give your body a break, run as you feel, and you will do awesome things after you give birth! Thanks for the advice and encouragement, Jen. I hope I don’t surpass Pete on the scale, I hadn’t even thought of that! I’m trying to get back into the habit of running every day now that I’m feeling better. I really want to keep running all the way until August (however slow that may be), but I might have to join a gym since it gets so hot here in the summer. Hey Mollie! Congratulations on the baby! I just stumbled into your blog and have really enjoyed your voice and insight about running, training, racing and the like. I ran at JMU with you, (way behind you), until I just couldn’t take the training anymore. It started to feel like a chore rather than what I had so enjoyed since the age of 10. I quit after my sophomore year and enjoyed several years just running whenever I felt like it, (with 3 half marathons and 2 fulls mixed in there). My husband and I became pregnant and had twins in 2009 and then a ‘surprise’ in 2011. 3 kids in 16 months is ludicrous but I’ll tell you what – I have never run so fast in my life! Is it my age? Is it some kind of crazy hormonal thing? I have no idea, but when I was cleared for exercise after both births, all I wanted to do was run, and suddenly my slow pace became 6:45. I wasn’t allowed any high impact exercising with either pregnancy as I was considered a high risk case, (as it was, my twins came 6 weeks early after I spent a whole month on hospitalized bed rest). Perhaps it was the forced time off, (oh what I would have given to run over those months!!! ), but I had a major ‘rebirth’ with running after my kids were born. It feels like it comes so easy now…and my kids are 3, 3, and 2, so it’s been a few years. I’ve definitely been riding the wave of my new found faster-than-ever legs, entering whatever races I can manage while being a stay at home mom. Just from winning local races I’ve reaped the benefit of a few prized weekends away with my hubby and extra cash in our pockets! Whatever the phenomena, my post kids body/strength/potential has pleasantly surprised me. I don’t have any advice about running while pregnant. I wish I had been cleared to but in my case I think it was probably better that I stayed mellow. But I am thoroughly impressed by the level of mileage you are keeping up while pregnant! So awesome! Best wishes for a safe, healthy and fun remainder of your pregnancy! I look forward to following your blog! Keep up the good work!